Welcome to the Marshall University Parking Enforcement Services. 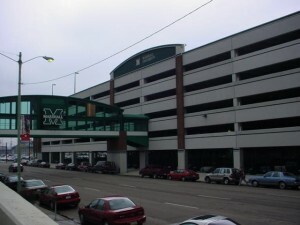 The Marshall University Campus is located in Huntington, West Virginia in an urban area and parking spaces have been provided within the limits available. This website will describe the regulations that are necessary for parking on the university campus for the safety and convenience of the entire University community and visitors. The Marshall University Parking Enforcement Office is located in the Office of Public Safety building at 1801 Fifth Avenue. Office hours are Monday thru Friday from 8:00AM to 4:30PM. Permit parking is enforced from 7:00AM to 7:00PM, Monday through Thursday and 7:00AM to 4:00PM on Friday. All other violations are enforced 24 hours a day by the Marshall University Police Department. Parking regulations are enforced throughout the entire calendar year and are not directly associated with the class schedule. Whether you are a student, employee, or visitor, we are glad you are here. Parking is a limited resource at the University and we ask that you observe all parking regulations on campus. We thank you for your cooperation. These regulations apply on the streets, sidewalks, and walkways, alleys, parking areas, parking spaces and parking lots on all parts of the University Campus. Penalties for violations include citations, towing and withdrawing of parking privileges. Any person owning, driving, or having custody of a motor vehicle on university property must comply with the regulations and procedures. All parking facilities, except the pay lot meter, parking meters, and the pay by the hour 6th Avenue Garage, require a parking permit during enforcement hours. A parking permit does not guarantee the availability of a parking space. It grants only the privilege in an assigned area. Absence of a parking space does not justify violation of any parking regulation. In addition, by parking a vehicle on University property, the University assumes no liability for loss or damage to a vehicle and its contents. Off-Campus parking in areas and privately owned lots adjacent to the University are available at varying rates. Anyone wishing to use these spaces should make individual arrangements to do so. Those who utilize on street parking should be aware that the City of Huntington maintains parking meters on 3rd, 4th and 6th Avenues. There are no large scale commercial parking facilities available in the immediate vicinity of the main campus.